With the 2000s now in the past its time to take a look at how each team faired throughout the decade. As some of you may recall, I did a similar analysis this time last year breaking down the nine year trend of each team. There were a few close races and it is interesting to see how everything broke down. 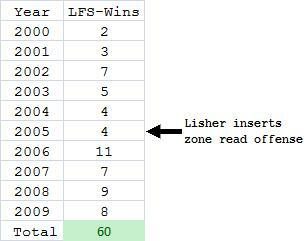 Each team is listed, followed by their win/loss record, followed by their winning percentage. Also, I broke the 12 team league down into three different sub-groups based on their win/loss totals. At this point in time last year Olathe North was sitting at 87 wins and the only way they could reach the century mark was to win the state championship going 13-0. Well, low and behold they did it, bumping their average victories per season to 10. The Eagles (left) were also the only team to win a state championship during the decade, claiming titles in five of the 10 years. 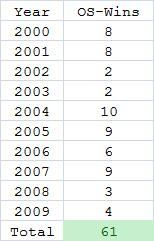 Olathe East can hang their hat on the fact that they were the only team in the league to have a winning record in every season during the 2000s--even mighty Olathe North suffered a 4-5 season in 2006. 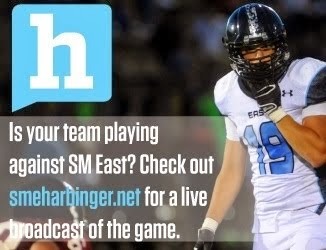 Despite not winning a state championship during the decade, Olathe East was the model for consistency within a program. The Hawks were also one of only three teams to retain the same coach (Jeff Meyers) for all 10 years. Olathe South (below) and SM West (right) both finished with identical records of 61-40. It was pretty crazy that the two progr ams played the exact same amount and won the exact same amount of games. Given the chances for variation of games with the playoffs, I find their identical win/loss record to be quite astounding. SM West won a total of seven games in the first three years of the decade, before Tim Callaghan was brought in as head coach in 2003. 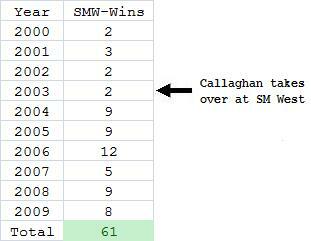 Following an initial season of 2-7, Callaghan and the Vikings finished off the last six seasons of the decade going 52-13 (.800). Olathe South's efforts could be described as boom or bust. The Falcons win totals had an eight win improvement from 2003 to 2004, and also a six win decline from the 2007 to 2008 (following the departure of head coach Mark Littrell), amidst state championship runner-up finishes in 2004 and 2007. Lawrence Free State (right) slides into the fifth spot on the list with a 60-45 record. The Firebirds can thank Bob Lisher's spread movement for the success. The team was a lowly 25-34 from 2000 to 2005. In 2005 the Firebirds starting running a spread, zone read option offense. The process took a year, but in 2006 it helped the team explode to an 11 win season. Granted, athletes like Ryan Murphy, Craig Rosenstengle and Camren Torneden were essential to the successes of such an offense, but the change in philosophy worked well. The school won 35 games in the last four years of the decade, including a trip to the state championship in 2008. Nobody saw Lawrence's dreadful 1-8 season coming; the Chesty Lions slipped two slots to #6 on the wins list, getting passed by SM West and hated rival Lawrence Free State. When looking at the Lawrence's season by season results it appears that there was a general build up to the school's 10-2 season in 2005, followed by a gradual decline to the 1-8 record in 2009. You could say SM Northwest's efforts are a more minor version of SM West's. The team achieved some of its best season's more recently with the arrival of Aaron Barnett, but despite this the school never posted a 10 win season. The Cougars were the closest representation to a .500 team during the decade. SM East and SM North both finished with the same amount of victories but SM East made the playoffs in more seasons so they get the nod for the #8 slot. SM South appears to have really underachieved given the fact that they are 10 wins behind both SM East and SM North, two programs who you could argue had a similar talent pool. Olathe Northwest's numbers are obviously skewed since the school didn't compete on the varsity level until the 2004 season. However, their win percentage still only ranks them tenth among the 12 teams. Leavenworth remains the league's cellar dweller. The school suffered through four winless season during the decade, and peaked with a 4-5 squad, led by quarterback Adam Booth in 2004. *Olathe North played in Class 5A from 2004-2005. 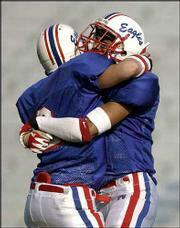 **There were ties for the Sunflower League Championships in '00, '01, '05, '06, and '08.